In parallel processing, a list of actions is executed concurrently but independently. Learn to achieve this with Scatter-Gather in Mule in this tutorial. Parallel processing is a technique where a list of actions can be executed concurrently but independently and the parent flow will not continue until all actions are completed. This can be done in Mule using Scatter and Gather flow control. Consider an example: a flow should call 2 REST services concurrently and combine the result and return. We are going to use the below REST API in our flow, which returns a post per call and takes Post Id in the URI. Below is a screenshot from POSTMAN tool. Start your flow with an HTTP Listener and configure it with 8081 port; following that, drag a Scatter-Gather Flow control. In each flow, get an HTTP connector like below to call a REST Service. 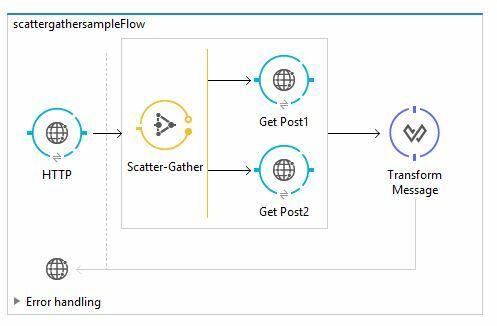 After the Scatter-Gather flow control, get a DataWeave Transform connector which does the actual transformation. Our transform shape would look like below. We could access the output of Scatter-Gather like an arraylist in the transformation. <mule xmlns:dw="http://www.mulesoft.org/schema/mule/ee/dw" xmlns:json="http://www.mulesoft.org/schema/mule/json" xmlns:scripting="http://www.mulesoft.org/schema/mule/scripting" xmlns:http="http://www.mulesoft.org/schema/mule/http" xmlns="http://www.mulesoft.org/schema/mule/core" xmlns:doc="http://www.mulesoft.org/schema/mule/documentation"
Scatter Gather is a costly operation because it uses multiple threads to complete the list of actions, but it executes the actions concurrently and independently. It will not complete until all the actions are completed in all the branches. if you have a direct call or a subflow inside the scatter gather your parent flow's exception handling will take effect. If you need to take care of the exceptions individually have a flow in the place of subflow like below. In the "combine-all-3-responses" transform component now either I will receives each component's failure or successful payload. My each flow will be similar to this.